With the rise of e-books, perhaps we ever thought we recommend an e-book some or all of our followers on Twitter. Ways to be many, but directly, we have Twtebook. 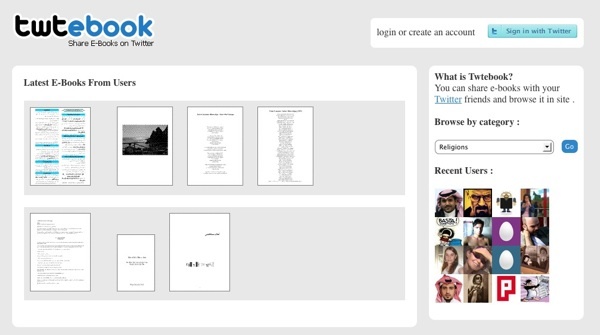 Its operation is similar to Twitpic, where we have to allow the application to access your Twitter account then go to the e-book document sharing, choosing one of the available categories. In this way, we already have e-books easier to share, thanks to the categories, we can discover new titles that perhaps we might find interesting. In any case, Twtebook allow us access to the contents of e-books, provided we have Adobe Reader or your browser has support for PDF files.